I'm a firm believer in the KISS principle: Keep It Simple, Stupid. However, I've been a user of PCs for a while. My first true computer (i.e., one with a hard drive) was an IBM PS/1 386 that whistled along at a blinding 25 MHz. Still, I envied my Mac buddies at work. Here were these wonderful machines that pretty much ran right out of the box. Couldn't say that about PCs. And the graphics those Mac-heads were used to dazzled me! So my lil' PS/1, nicknamed Emma, ended up with Windows 3.1, just to be more Mac-like. Then, one day, I found it. Alongside a road, wrapped tightly in clear plastic bags, was a computer. I am a known rescuer of computers - at that time I had "resurrected" about a dozen - but this was an unusual beast. It was large and accompanied by two smaller units. I heaved it into the car. When I returned home, I discovered that all three items were emblazoned with the Apple logo. I'd never seen a machine like this. 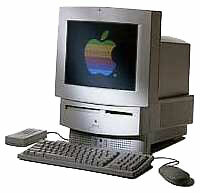 It turned out to be an Apple Lisa 2 with two Profile 10 MB hard drives. One of the drives had the Mac OS on it. The machine had the Sun Remarketing upgrade and was running System 6. Unfortunately, I had to let the machine go; I was moving, and I had only enough room for the old IBM. I might add that the gentleman that got the Lisa was tickled pink. In the meantime, I moved up to Pentium-class PCs. I still wanted a Mac, however. I ended up adding GEM version 1 to my PC - just to have a Mac-like desktop I could use to launch DOS programs! It was in December of '99 that I had my second chance. I was perusing a local flea market when I came across a teenager with a table of collectible cards and a lone Mac Performa 578. The price he listed was $20. "$20 for a Mac? What's wrong with it?" "Well, it ain't complete. It's missin' some stuff. I don't know what." "Okay, you can have it for $10," he said. $10? I sighed, bluffing as best I could, "Okay, I guess it's worth a shot," and handed him the cash. What I got was a fully functional Mac. The SCSI cable had come loose, that was all! It also turned out that the Performa had belonged to my old veterinarian. I called him up and asked if he was aware that I now had his old Mac. He informed me that he had given the machine to his receptionist's son, and that the boy just wasn't interested. I still have a PC; that's how I'm writing this. However, I also own two Macs now, the Performa and an SE. I'm still a newbie with the Macs, but I am truly a convert. By the way, I carried on my old habit of naming computers. The Performa is Sophie, the SE is Selina. Together with Ariel, my PC, my girlfriend can at least rest comfortably knowing that the only "other women" in my life are machines. If I get too intimate with them, she's threatened to steal their power cords.